If I could categorize my personality by using flavours, then I would be a citrus person. I love all things citrus, whether in fruit, scent or flavour. My favourite citrus is limes – to use with an ice cold margarita or even to clean my fridge with. So, when making a green curry paste I tend to make sure it is ‘heavy’ on lime. This recipe below is exactly that – it has the wonderful lime scent and the strong chilli flavour is complimented by the soft notes the lime brings to the party. This recipe is a combination of the one out of my Curry recipe book, and the one given to me by Alvin Quah. You will never use all of this paste at once, but you can make it and store it in the fridge to use each time you want to make a green curry. Just fry a few teaspoons of the paste before adding it to your chosen ingredients. Hmm, I think I’m salt. Or maybe pepper. Mmm, curry! I’ve always wanted to make my own curry paste, but oh, there’s a local thai place that is just so good–and cheaper than buying some of the supplies, lemongrass is expensive around here and I don’t think I’ve seen galangal although I bet it’s at the international market. I will do it one of these days! My own fresh curry paste sounds amazing. Sounds gorgeous – will have to put in a request to my next batch of visitors for some of the ingredients! lucky you they all agree to bring you things! Just love Thai curries – red or green. Sounds like a delicious paste. 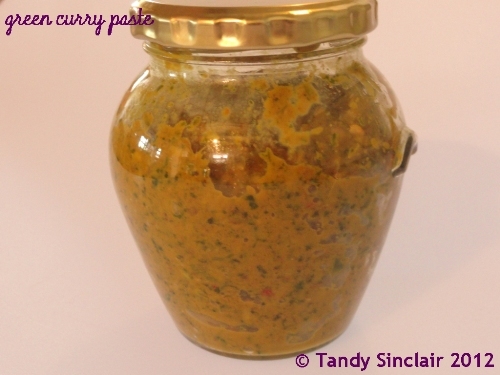 What an incredible curry paste recipe Tandy – green curry is one of my favourites. I can almost smell how fragrant this must be. This would also make an awesome gift.